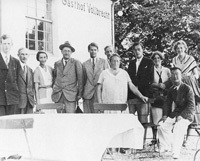 Emmy Noether with colleagues and friends near Göttingen, 1932. As a result of her intellectual commitment and the effectiveness of her ideas, Noether was a magnet for a considerable number of students as well as for established mathematicians. Göttingen, which in the early 20th century was considered the “Mecca” of mathematics, achieved its international renown largely due to the influence of David Hilbert and Felix Klein, aided by a large number of significant Jewish mathematicians and physicists. More than a few of Hilbert’s 73 doctoral students were Jewish, for instance Otto Blumenthal, Max Dehn, Felix Bernstein, Ernst Hellinger, Alfréd Haar, Richard Courant, Hugo Steinhaus, and Jacob Grommer. This extremely productive period came to an abrupt end with their exclusion and expulsion after 1933. One scientist who embodied the lively oral culture of mathematics that characterized the atmosphere in pre-war Göttingen was the exceptional Emmy Noether. Noether made important contributions to abstract algebra, as well as to mathematical physics, topology and number theory. She was one of the first to point out the possibilities of applying modern algebraic methods to topology. However, as a women and a Jew, she did not get tenure and even had difficulty obtaining her "Habilitation" (university teaching qualification). Like all other Jewish mathematicians, Emmy Noether was expelled from her university after the rise of the Nazis to power. She emigrated to the U.S.A., where she taught at Bryn Mawr women’s college until her untimely death in 1935.